Mountain Hardwear's Microchill Jacket is much more a midlayer than true outerwear, but however you wear it, the warmth to weight ratio and comfort are excellent. In terms of thickness, the fleece Microchill is in the same range as expedition-weight underwear. It is highly breathable, with just a hint of wind resistance thanks to a clever front nylon lining. The full zipper adds versatility, earning the Microchill at least some credibility as a fair-weather jacket. Pair it with a windbreaker and you've got a great fast-and-light system for spring mountaineering. I like that Mountain Hardwear gives us an abundant number of vibrant color choices—we're not forced to choose between burnt or faded. The fit is slightly relaxed, but there is a waist drawcord to cinch things up as needed. Two zip handwarmer pockets complete the amenities. If you want, you can drop three ounces by switching to the "Zip T" version of the Microchill and losing the full front zipper. As noted, however, you do give up some versatility: the combination of the front zipper plus the interior front lining does add up to a quite useful range. The jacket provides an especially notable amount of warmth for the weight, approaching that of much heavier fleece jackets. Note that there is also a "Tech" version of the Microchill, which uses a lighter fleece overall plus stretch panels for a closer fit. While it is more suitable for high-output burns thanks to its greater ventilation, at ten ounces, the Tech model isn't much lighter than the Jacket, and it's certainly not as warm. Myself, I'm torn between the jacket and the zip T versions. Realistically, you're going to have something like the Microchill in your gear closet, probably in both versions, and you're going to be wearing it a lot. So let's not over-think things. 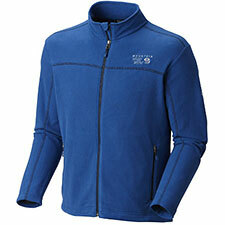 With either model, you get a well-constructed, handsome, high-end fleece top at a great price. That's good enough for me—recommended.